People grasping headshots, resumes and clipboards that held a sheet of paper filled with their personal information stood in line during the Sunday heat, lining a street in the Allston area in hopes of achieving a role as an extra in the upcoming movie “Patriots Day,” which will star Massachusetts native Mark Wahlberg. Thousands of eager actors and actresses jumped at their chance to be an extra in Mark Wahlberg’s new movie “Patriots Day” about the Boston Marathon bombings. PHOTO VIA WIKIMEDIA COMMONS. This film is one that will exhibit the horrific Boston Marathon bombings that occurred on April 15, 2013. In my opinion, I expect that this film will be a great tribute to the traumatic events that occurred. The Boston Globe reported that director Peter Berg and reputable actor Wahlberg said they want to make a moving film that will be respectful toward those involved in the events. The Boston Globe also stated that Berg said they are “aspiring for real authenticity,” which is why they are filming in the actual locations where the events took place. 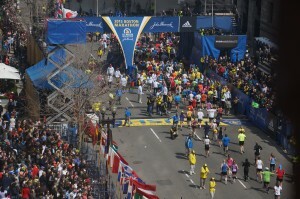 Furthermore, according to The Boston Globe, Berg plans on re-creating the bombings on Boylston Street in Boston. I was one of the thousands to audition for this film Sunday afternoon. As soon as I has jumped into line, tons of people crowded behind me. Thankfully, even with the massive number of people, the line went fairly quickly and there was not much of a wait before we were all seen by the casting agency. The Boston Police had closed off the area when I first arrived, and its cars surrounded the premises as well to manage the number of people that showed up to audition. While I was in line, I chatted with those around me. I heard stories of how they were cast as extras in other movies — one woman said she had just taken part in the recent film “Spotlight” as an extra. Some people in line wore the familiar Boston Marathon sports jacket that you receive if you participate in the events, and others wore nurses’ uniforms. The casting agency, Boston Casting, was looking for those in particular who had experience being a doctor, nurse, police officer or runner. During the audition, Boston Casting founder and casting director Angela Peri told my group that thousands had showed up for the audition, and some people even showed up at 4 a.m. even though the doors opened at 10. Peri had us circle up, and she detailed what it meant to be an extra and what the rules were. According to The Boston Globe, this casting call was the largest local turnout in Peri’s 20 years of experience. The crowds seemed to be endless. That being said, though, the casting agency managed all of the people who showed up well. Regardless of whether or not I get cast as an extra in this film or not, it was an interesting experience that allowed me to meet many intriguing people.